January can be the most wretched month in the garden with very few moments of joy to relieve the grey skies and cold, damp air. 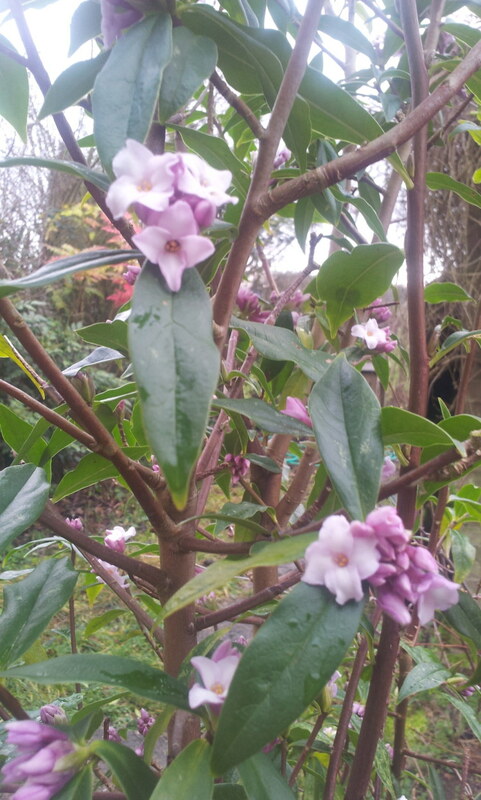 One plant that can be relied on to provide a moment of relief is Daphne bholua ‘Jacqueline Postill’. It’s a tall, slender evergreen shrub that has clusters of small pink flowers. The flowers themselves are not that remarkable but the scent they pump out is as extravagant as the chicest Paris perfumery. The fragrance appears suddenly: one day there is nothing and the next, with the help of weak January sunshine, the flowers open and the air is filled with perfume. One whiff and you are intoxicated, transported to the summer days filled with roses and lilies and warmth. Mine is planted a few metres from the kitchen door where it stands to welcome us back from a muddy tramp through the fields after walking the dog. I first came across it, smelled it, on a visit to see the winter garden at THe Cambridge Botanic Gardens. It was tucked away behind a gift shop but its scent was everywhere. Mine was planted as a young thing about 30cm (1ft) tall. Ten years on it has grown to 2.1m (7ft) tall. To grow well it needs to be protected from high winds and fierce sunlight (our house protects mine from both). It is essential that the soil is free draining – wet soil will kill it. The species is found in the Himalayas and in mountain ranges from Bhutan down to Vietnam. In Nepal it is used to manufacture paper and is sometimes known as the ‘paper Daphne’. This cultivar was raised in the early 1980s by Alan Postill, a propagator at the famous Hilliers nursery in Hampshire, England who romantically named it for his wife.